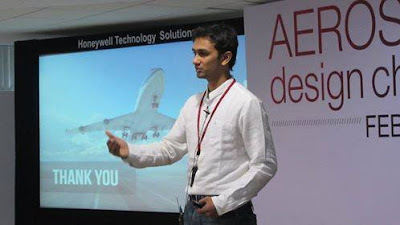 Honeywell has announced the winners of the fourth edition of India Aerospace Design Challenge, the annual competition sponsored by Honeywell to attract and develop talent in India for its growing Aerospace industry. The company announced the winners on India’s National Science Day, celebrated each year to mark the discovery of the Raman effect by Indian physicist and Nobel Laureate Sir Chandrashekhara Venkata Raman on February 28, 1930. The 2017 Honeywell India Aerospace Design Challenge drew the participation of 239 students from 19 design institutes across India. The students were charged with designing a user-friendly, enhanced situational awareness solution for Aerospace communication, navigation and surveillance. Akhil Patel and Harmeet Singh from the Indian Institute of Technology, Guwahati, and Harshika Jain and Salil Parekh from the National Institute of Design, Ahmedabad, were announced winners of this year’s contest at the award ceremony held at the Honeywell campus in Bangalore. Started in 2014, the Honeywell India Aerospace Design Challenge is an annual contest for college students to design innovative solutions addressing specific needs of the Indian aviation industry. More than 650 students from 20 institutes in both aviation and design fields have participated in the yearly competition.